Exceptional Villa in Provence - Paradise above the canopy! 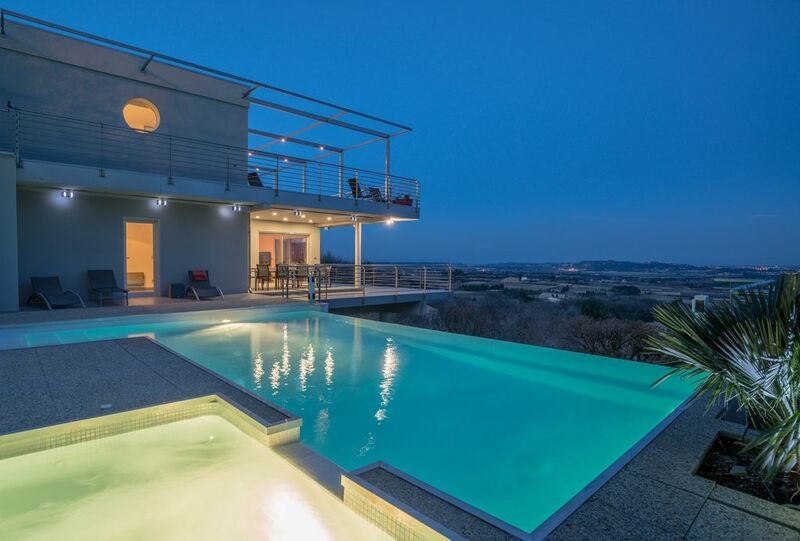 Contemporary villa, infinity pool and heated spa, exceptional views. VILLA ALBA is a spacious villa in Provence, 8 rooms, 5 bedrooms, 3 bathrooms and upscale services. Its faïencée infinity pool and spa, heated all year (28 ° to 31 °), welcome you in any season. Recently built and inspired by the Modern Architectural Movement (simple volumes, purity of lines and white, large glazed surfaces), it is in line with the achievements of Mallet-Stevens and Le Corbusier: house built on stilts, roof terrace, plan free, wide horizontal bands. Find us, with lots of other information about villa Alba and its surroundings, on "villaalba" via Google. With a 180 ° EXCEPTIONAL VIEW on the region, it is a villa for rent in Provence, in the south of France, ideal to come spend your holidays in any season, thanks to its SWIMMING POOL and SPA HEATING (28 ° at 31 °). Located on the heights overlooking the plain of Rochefort du Gard, near Avignon, in a QUIET area, without traffic noise, the villa is bright and enjoys large volumes. It develops 500m ² [203m ² habitable + 300m ² of terraces]. Villa Alba is located a few minutes from the center of the pretty village of Rochefort du Gard, with its cafés and its Provencal market on Sunday, the ideal central point to visit Provence. The village supermarket, very well supplied, will allow sedentary to spend a holiday without stress. Placed in a dominant position, in a forest of oaks, the villa, opened on the valley and the vineyard of the Côtes du Rhône, offers thanks to its vast PANORAMIC TERRACES a stunning view - one sees on the horizon the Alps, the Dentelles of Montmirail, Mont Ventoux, the Monts du Vaucluse, Luberon and the Alpilles. Come to live also this visual experience from the infinity swimming pool, the sight is BREATHTAKING (8m x 4. 2m + staircase and jacuzzi 2. 5m x 1. 6m each, the bottom is in gentle slope and the low point is to 1 65m deep). Although located in a very quiet environment, Villa Alba remains close to the city, 10 minutes from Avignon by car, and major communication routes. Access is easy from the A9 motorway (10 minutes), Avignon TGV station (15 minutes, transfer possible) and the A7 motorway (25 minutes). A COMFORTABLE stay awaits you, the equipments are recent and the bedding is of hotel quality. It is an idyllic place to spend a few days quiet, lying on deckchairs and chairs panoramic terraces, facing the vineyards of the Côtes du Rhône and a landscape that resembles Tuscany, the sun, the mountains on the horizon and under the cicadas' singing. Villa Alba is the CENTRAL point which allows to visit in a few days the most famous places of the Provençal region: Avignon, Nîmes, Pont du Gard, Saint Remy de Provence, Orange, Arles, The leases of Provence, Vaison the Roman. AROUND, the prestigious Côtes du Rhône vineyards: Châteauneuf-du-Pape, Gigondas, Tavel (wine tour). You can also visit the mills of olive oil. The tastings are waiting for you. The region is also famous for its GASTRONOMY, its good tables that are many around and who know so well marry olive oil, tomato and basil. A few kilometers from here, you can spend a pleasant day: canoeing, swimming, picnic at the edge of the water, and discover the Pont du Gard and the wild Gorges du Gardon. The many hiking trails from the village will allow you to discover the Provencal scrubland and breathe the air and the scents of its wild essences. You can also go jogging and cycling from Villa Alba. Here no nocturnal light pollution, the sky is exceptionally clear. Lying on the panoramic terraces, you can, in the evening, observe the starry sky, its constellations and rediscover the murmurs of nature. A question ? Do not hesitate to contact us now by clicking on "Contact the owner" (blue color), which you will find next to our name. WEBCAM DIRECT LIVE: come see the amazing view of the villa by connecting to our webcam facing the valley. Contact us to get the connection parameters. You can also find us, with many other information about the villa Alba and its surroundings, on "villaalba" via Google. Sheets and towels are provided, not pool towels. "Great great place enjoyed by three couples for one week." Merci Jean-Pierre! Thank you for sharing your beautiful villa with us. The view is magnificent…as remarkable as the best we have seen around the world. And thank you for your advice on the sigths of this beautiful region, and your help in adapting to your home’s technology." Everything was just as advertised. Fantastic villa with fantastic views! Clean and spacious with a lovely pool and a breathtaking view. Stunning contemporary villa with views. Villa Alba has a commanding view of the area near Avignon and is well-located for day trips to wineries, hill towns and Roman ruins. The owner offers helpful suggestions. Villa Alba is every bit as spectacular as the photos suggest. The views from rooms, balconies and pool area are panoramic and beautiful. The living space is well appointed, clean and well maintained. Jean-Pierre (owner) met us upon arrival and explained how to use the villa security system, open driveway gates, operate window shutters, kitchen appliances, laundry appliances, television, etc. Each of the five bedrooms is provided with attractive bed linens. Bathrooms are comfortably sized. The kitchen is well equipped with pots, pans, cooking utensils, and an ample supply of dishware, glassware and eating utensils. For those who want to cook, there are various bowls, baking pans, etc. The villa is amply furnished inside to accommodate a full house of occupants. Similarly, there is plenty of outside furniture (chairs, tables and lounges). The villa is located in an area served by narrow paved roads that meander through fields, vineyards and up hillsides. The owner provides good directions to reach the villa from Avignon, but a car equipped with a GPS navigation system is a big help (especially when returning to the villa at night). There is off-road and inside the security gates parking space for multiple cars (in villa's garage and driveway). We thoroughly enjoyed our stay at Villa Alba and our visit to towns and tourist attractions in the general vicinity. Our stay at Villa Alba was fantastic! The villa is amazing. It is impeccably clean. There is everything you need for an amazing stay in Provence. The sleeping accommodations were wonderful and very comfortable. The views were breathtaking. Our whole family enjoyed swimming in the pool after day trips to various sites and cities in the region. The grill was a bonus for Provencal dinners at home. We were warmly welcomed by Jean-Pierre. He was helpful and responsive before and throughout our visit. We received a lot of information about the region from the Brunels. We wholeheartedly recommend that you stay at Villa Alba while in Provence. Superb place! - Mahtava paikka! This house was built with love and it was also taken care by the owner Jean Pierre, who was really helpful and caring. The combination of the modern architecture and gorgeous view to the valley and mountains makes a perfect mix. House is carefully designed to level with a free panoramic vista, all exterior design choices match with the location: dual gated car park for easy in-out driving, site used in three levels, sun directions and all details of places to rest, eat, grill, swim etc. We were just five but the house could have easily hosted 10 visitors and even more enjoying a party for example. Site location is perfect for touring around southern France. We can warmly recommend this place to any family or group of adults as a place to enjoy! Erittäin siisti, viihtyisä ja hieno talo, johon 5-henkinen perheemme mahtui hyvin, mutta tilaa riittäisi jopa 10 hengelle. Talo edustaa modernia arkkitehtuuria, ja se on hyvällä maulla sisustettu. Pihalla on lämmitetty uima-allas, ja kahdelta terassilta avautuu upea näköala vehreään laaksoon ja vuorille. Talo sijaitsee viehättävässä kylässä, mutta sieltä on myös helppo tehdä retkiä läheisiin kaupunkeihin (esim. Arlesiin ja Avignoniin). Vuokraisäntä oli ystävällinen ja avulias. Voimme erittäin lämpimästi suositella taloa perheille ja seurueille. - 1 hour from Gordes, Roussillon, Colorado Provençal Rustrel, Sénanque, Isle sur la Sorgue, Vaison la Romaine, Mont Ventoux, Orange, Fontaine de Vaucluse. - 1 hour from Aix-en-Provence, Les Saintes Maries de la Mer and La Camargue. Les frais de ménage sont inclus. Les draps et les serviettes de bains sont fournis. Les charges d’électricité sont incluses dans la limite d'un montant de 100€/semaine (relevé effectué en début et en fin de séjour). Au delà, facturation au prix du kwh(12,64cts/kwh HC et 15,85cts/kwh HP). La réservation est effective à la réception de l'avance (30 % du montant de la location). Le solde est versé 3 semaines avant l'arrivée. La caution (1000€) est remise à l’arrivée ou réglée par virement bancaire en cas d’absence de chéquier.